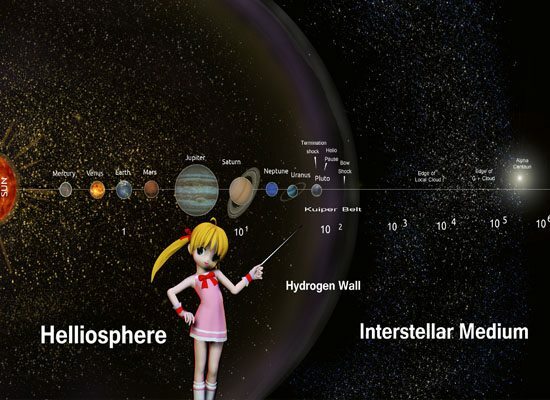 Home » Curious Mind » The Oort Cloud: Is it for Real? 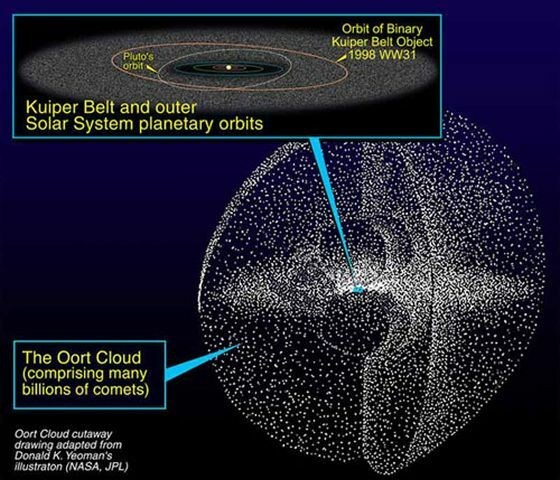 The Oort Cloud: Is it for Real? Think of the Oort cloud as an expansive region with icy comets making up a spherical cloud surrounding the Solar Sytem of Earth and extending approximately 3 light years, about 30 trillion kilometers from our Sun. This vast distance is considered the edge of the Sun's orb of physical, gravitational, or dynamical influence. Dutch astronomer, Jan H. Oort proposed the existence of the comet cloud from the physical evidence of long-period comets entering the planetary system in 1950. He also figured out the rotation of the Milky Way galaxy in the 1920's, and recorded comet orbital distribution with only 19 well-measured orbits to study and identifying where these icy visitors to our star system might come from. Within the Comet cloud, the giant ice rocks are suppoedly tens of millions of kilometers apart. The comets are weakly bound to the sun's gravity and passing stars or other forces can drastically change their orbits to send some of them icy bombs, hurtling like looping missiles into the inner solar system or out to interstellar space. The structure of the cloud is supposedly a rather dense field near the core near the ecliptic plane and slowly extending to the outer edge. One sixth of an estimated six trillion icy objects or comets are in the scattered outer region while the bulk of the comets are gathered close to the core. A team of astronomers led by Anita Cochran recently used the Hubble Space Telescope to find and identify some Kuiper Belt comets. The icy bombs are considered very small (only 20 km or so in diameter). As many as 100 million such comets may be out there and not readily detectable even by the Hubble telescope. The Kuiper Belt is a sphere shaped cloud of icy remnants located past the orbit of Neptune extending roughly from 30 to 50 AU from the Sun that is considered as the source of most short-period comets. The Oort cloud is the source of long-period comets and possibly the comets' Halley and Swift-Tuttle. Two recent Oort cloud comets were Hyakutake and Hale-Bopp. collections of icy missiles far out past our star system. They are considered as the primordial remnants of the nebula that coalesced to form the entire Terran solar system. Identifying their composition and distribution has provided tangible constraints on modeling the early development of our star system.